Today we had a busy day visiting an old Cornish Mine, Standing Stones and a Lost Garden. 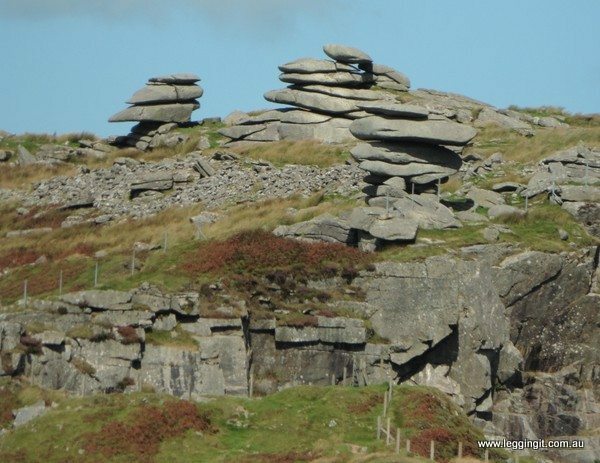 It was a full day which started out as a simple trip up to Bodmin Moor not far from Liskeard. On our way up towards Bodmin Moor we spotted a sign to Carnglaze Caverns at Neot, a few miles from Liskeard. 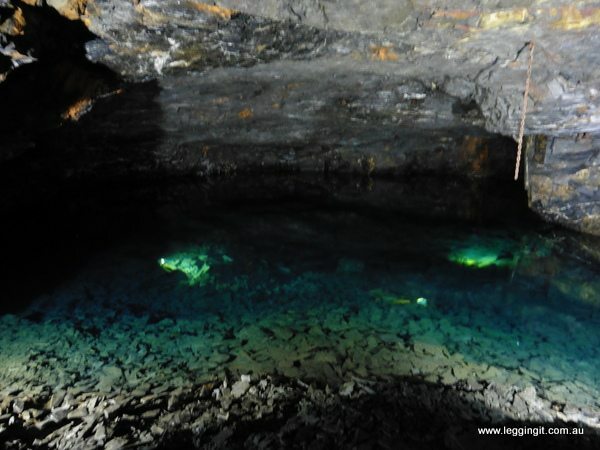 Carnglaze Caverns is a former slate mine which mined blue grey slate up until the mine closed in 1903. 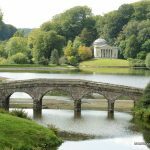 The industrial revolution had a huge impact on Cornish landscape with Tin and Copper mines opening up across the countryside. With all the new mines, ports, housing and buildings the demand for slate for roofs was huge. It’s said that ‘steam powered the industrial revolution’ but the blue grey slate from places like Carnglaze certainly roofed it. Usually slate was quarried in open pits but at Carnglaze it was mined underground, in fact the only underground mined slate in Cornwall. We picked up our helmets, map, safety instructions and wind up torch at the reception before heading underground. 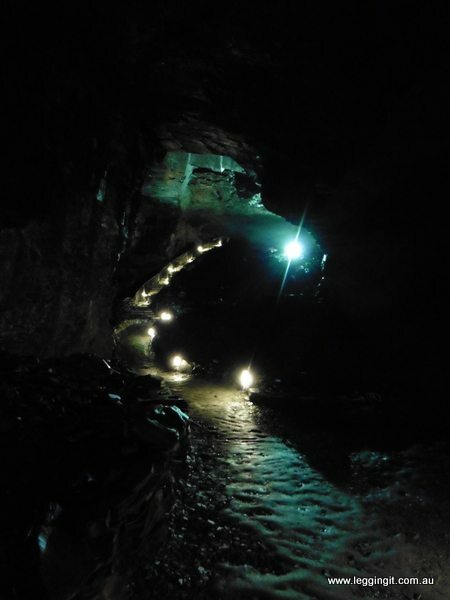 Carnglaze has self guided tours which allow individuals to explore the caverns at their own pace. They also provide guided tours. The three caverns which form Carnglaze Caverns extend about 150 metres into the hillside and slant down to a depth of about 60 metres. Along the way the local story of slate mining was explained. By candlelight miners worked in three man gangs, two men swinging sledge hammers and one holding the drill bit. Between each blow of the hammer the man holding the drill bit twisted it. The job on the drill was given to the youngest, youngsters usually only about 14 years old. Holding the drill bit as two men belted it with sledge hammers must’ve taken a lot of trust. When I was a kid when we were fencing at home I used to hold the star pickets whilst my father drove them in with a sledgehammer. The star pickets had to be held steady otherwise the hammer would miss the end of the post and straight onto your fingers. Holding a drill bit in the dark with just a candle providing light must’ve been hard going. The miners worked ten hour shifts drilling holes into blocks of slate. At the end of the working day explosive charges were set and the blast conducted. It allowed the site to be clear of people and the dust to settle overnight. At Carnglaze Miners built ramps at the working face, from rubble. It gave them a platform to work off and when the block was blasted it would slide down the ramp nice and gently. In the mine the slate was processed before transportation. As we explored the old mine we got a look at some of the conditions people had to work under. After the mine closed in 1903 it lay unused until the war when it was requisitioned by the Royal Navy. It became the Royal Navy’s rum storage. Safe and sound from bombs the rum was stored underground at Carnglaze. 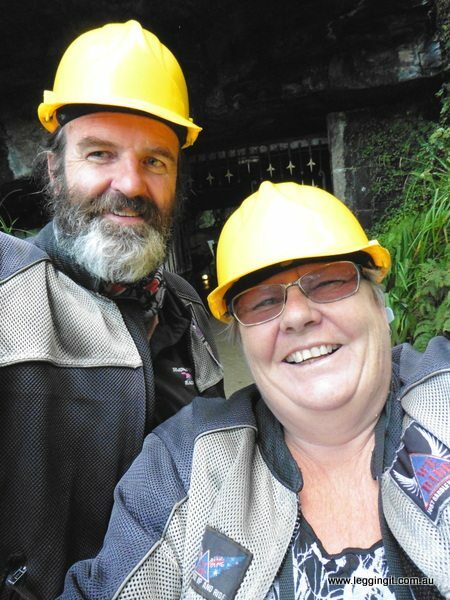 These days apart from tours the old mine is used for weddings and functions with the rum flowing at their underground bar. At the lower reach of the workings are two underground lakes filled with crystal clear water. The two lakes are quite beautiful and deceptively deep. 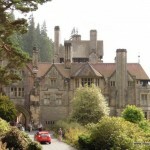 It’s also used as the setting for weddings with candles and fairy lights providing illumination. 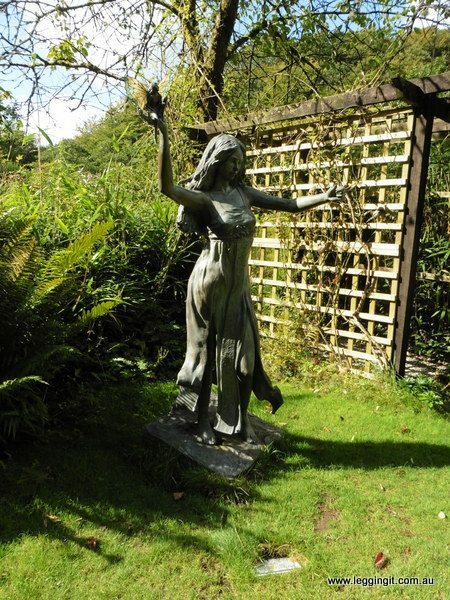 Theses days the grounds surrounding the mine are home to a woodland trail and lovely gardens. Overall it was a nice visit, quite an unexpected find which we really enjoyed. Back on the road we took the turning towards Minnions just before Liskeard. On the road towards the village of Minions a stone wall surrounds King Donierts Stone. It’s actually the remains of two stones King Donierts and one known as the “Other Half”. The other half looks like it fell off the top of King Donierts stone. Both stones are decorated with interlaced designs which are a bit weather worn. When the sun emerges it’s a little easier to see the design better. Inscribed on the stone are Latin words which translated from Latin roughly translate to “Doniert asked for this cross to be erected”. It’s thought that the script may refer to Cornwall’s last King, Dungarth (Donyarth) who drowned in 875. Not much is known about him but he may have been an under king. There’s speculation that he may have sided with the Vikings against the West Saxons. His drowning may not have been an accident but rather Saxon punishment. Heading towards Minions we were soon amongst moor land, where hardy looking sheep picked amongst prickly gorse. Arriving in Minions we were greeted by yellow smiling faces. The village has cashed in on the movie Despicable Me and have added Minions to their sign. At Minions we stopped to visit the stone circles known as The Hurlers. 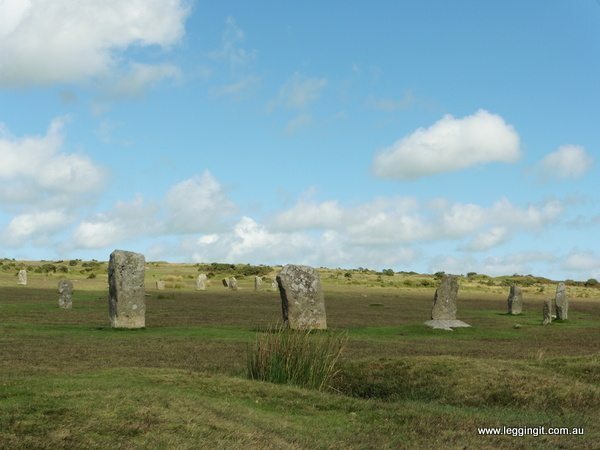 The Hurlers are three stone circles, on Bodmin Moor at the little village of Minions. The stones date from the late Neolithic early Bronze Age and like all stone circles the reason why they were erected is open to conjecture. There are theories that it was part of funerary ceremony as they align with the the barrow grave to the north and burials to the south. Other theories are that they are used for astrological prediction. Although the star alignment is different today, their alignment with Vega and Arcturus between 2100 and 1500 BC could’ve predicted things like the first day of spring. 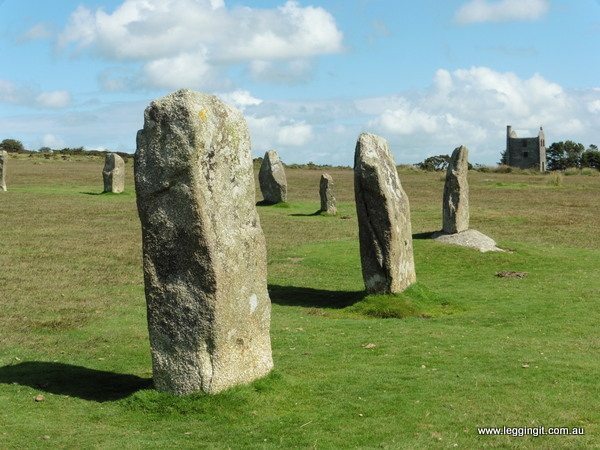 A popular legend has it that the stones are actually men, turned to stone for playing Cornish Hurley on a Sunday. 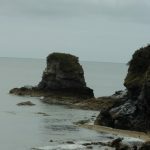 The legend probably originated with the Christianisation of Cornwall. The three circles are ringed by about thirty stones in each circle, with the central circle a little wider than the other two. The reason we say about thirty is that legend has it that no one can count the number of stones and come up with the same number twice. The site was excavated in 1930 and the central circle was found to have been paved with granite. Some of the stones were stood back up as over the years grazing cows had pushed them over whilst using hem as scratching posts. Not far away from the stone circles are another two standing stones known locally as the Two Pipers. Legend has it that two men were turned to stone for piping on a Sunday. 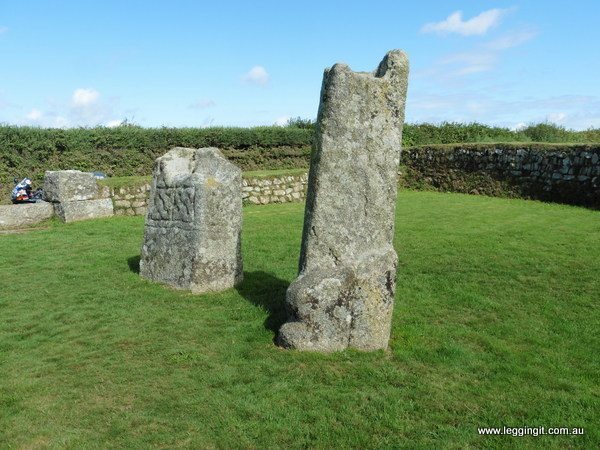 However, the two stones were probably a portal leading to the other three stone circles. Around the moor are abandoned mine buildings and rock offcuts from the quarrying of grey granite which occurred in the area. There was even a railway to Liskeard, the remains of which are still visible further down the hill. After a ride down into Minions and back up past the Mining Visitor centre we headed back towards St Austell. The ride took us up mossy covered single lane roads covered by archways of trees. It was really beautiful although a little slippery. Eventually we got back onto the A road towards St Austell which led us to the Lost Garden of Heligan. 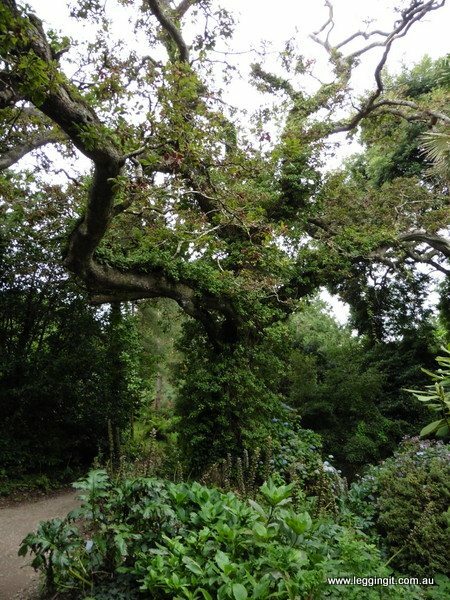 The Heligan estate is a 200 odd acre property about 2 km’s from Pentewan on the road between St Austell and Mevagissey. 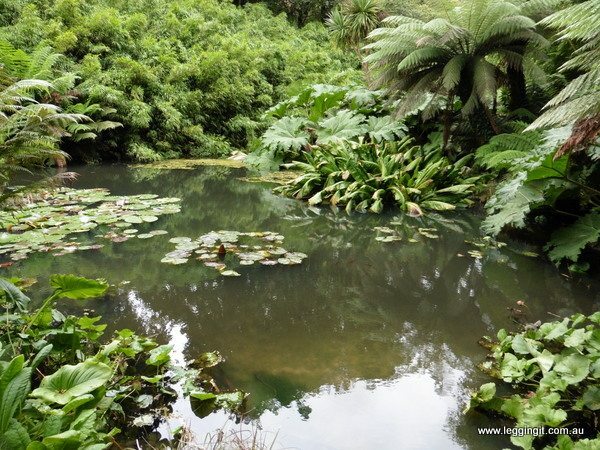 So why is it called the “Lost Garden of Heligan?” The story goes that the estate was the home of the Tremayne’s who operated a self sufficient farm right up until WWI. Thirteen of it’s gardeners signed up however, nine were killed in the Great War. After the war Jack Tremayne could no longer “live with the ghosts” so left the estate and rented it out. 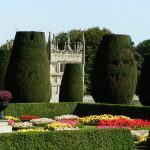 The gardens fell into disrepair and for seventy years were “lost”, overgrown by trees, covered in brambles and derelict. In 1990 a descendent of the Tremayne’s, John Willis invited Tim Smit, an archaeologist to the estate. At the entry to the Gardens a film of them exploring the gardens, like explorers of the amazon shows the extent of the overgrowth. 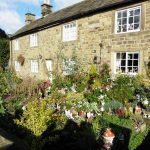 It’s quite amazing seeing the transformation of this garden lost for seventy years to what it is today. All the old derelict buildings and greenhouses have been restored. 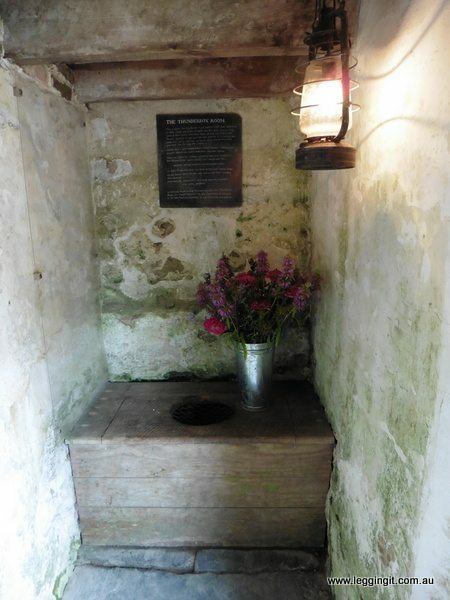 During their renovation they discovered the old gardener’s toilet, the “thunderbox room”. On its walls were seven signatures of former gardeners who joined up during the First World War. The renovations have been devoted to the soldiers and near the entry a storyboard pays tributes to the gardeners who joined up. We started our tour with coffee and cake in the spacious cafe which was overflowing with people. After our various stops earlier in the day it was nice to slow down a bit. 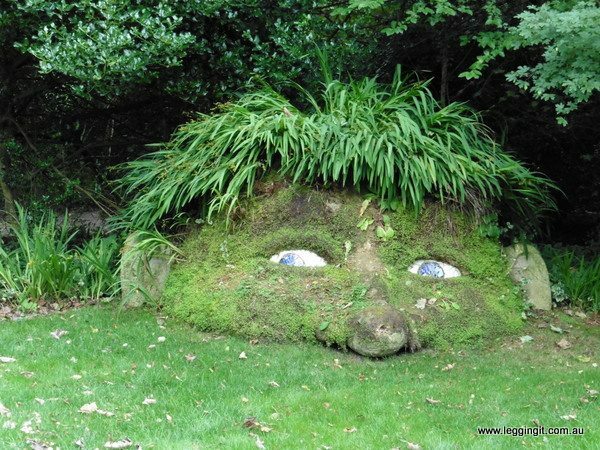 After paying £13.50 and armed with a map we head into the gardens and were instantly greeted by the Giants Head, a lovely feature of the garden. Wandering through the grounds it’s hard to imagine that it was once derelict. 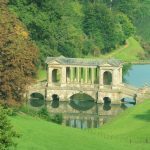 These days the garden has restored some of the lovely old features such as an Italian garden with a pavilion overlooking a water feature,a walled garden with vegetables and flowers, green houses and formal gardens. It was quite interesting discovering a 1800’s pineapple garden, a specially heated garden hothouse. 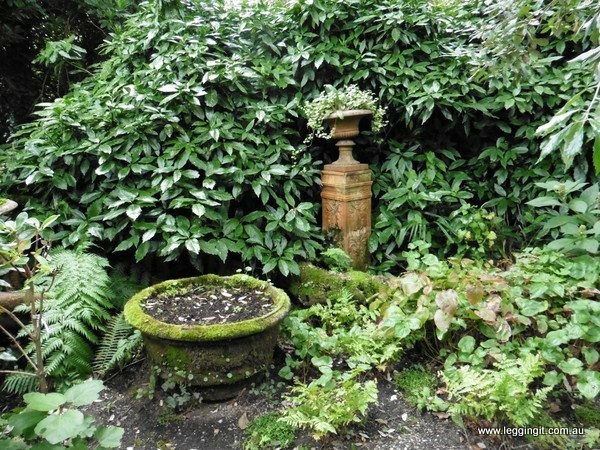 Throughout the gardens many ancient garden practices still continue. One of these was the ancient use of pigs to clear undergrowth. During the summer months they were allowed to graze in forests rooting up plants, acorns and knocking down undergrowth. 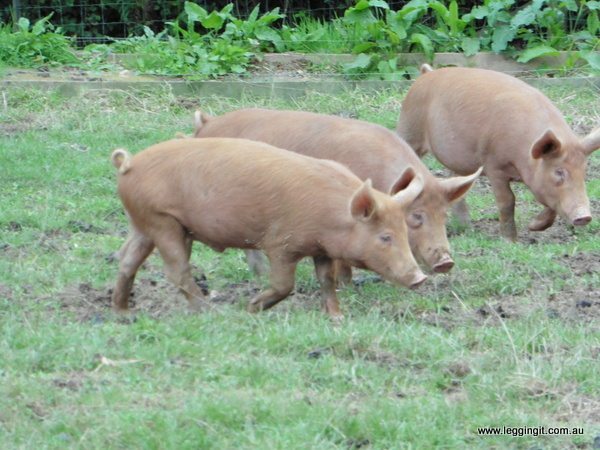 The farm specialises in old rare breeds of animals including Tamworth and Cornish Lop pigs, Highland, Dexter and White Park Cattle, Shire Horses, Devon and Corwall Longwool Sheep and older breeds of poultry. 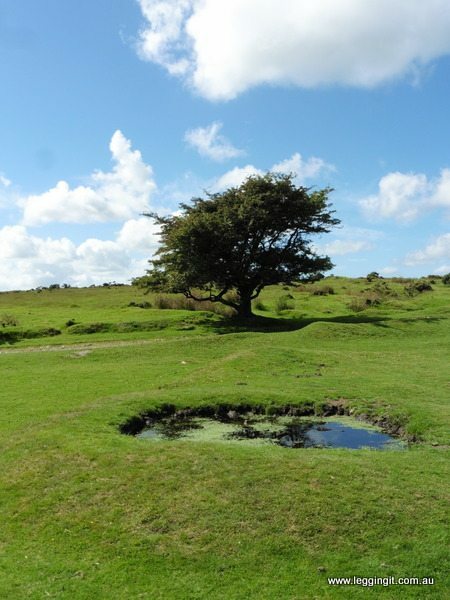 Throughout the estate are walks of varying difficulty, play areas, cafe’s, picnic areas, and a barbecue area. There’s also a wildlife hide for wildlife spotters. Towards the bottom of the property is an area known as the Jungle. Overlooked by the house the jungle is a gully with a a series of ponds feeding into each other. 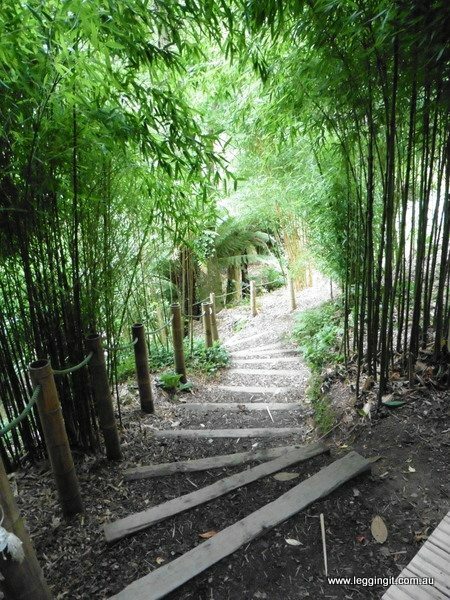 Surrounded by tree ferns and other plants reminiscent of the amazon jungle the area is a great place to lose yourself. As we had arrived late in the day we had the whole area to ourselves. Near the Burma Rope Bridge which spans the gully a sign warns of waiting times of thirty minutes focusing the bridge. We could’ve crossed the one way bridge both ways without fear of running into anybody. It was great. Below the Jungle a sculpture known as the Charcoal Sculpture pays homage to the ancient practice of making charcoal. In former times it was common practice on the estate. As the closing time of six o’clock was hurriedly approaching we headed back along the woodland walk. It took us past the sculpture of Grey Lady, a series of twisted metal being reclaimed by climbing roses. 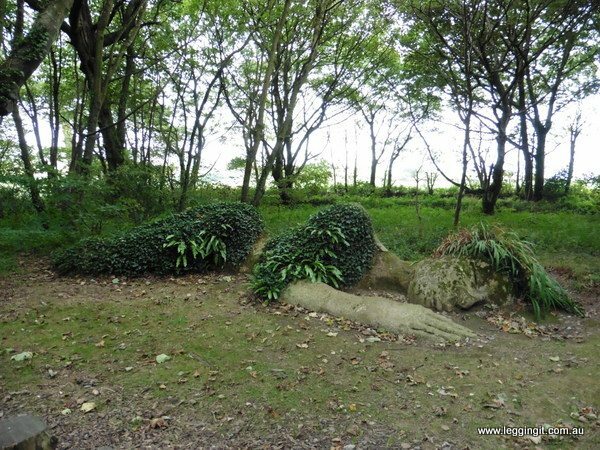 Further along the walk we spied Mud Maid, a sculpture of a sleeping lady. The woodland walk led us back to the entry where we are pleased to say we were the last ones to leave. There was so much of the garden we explored in just two hours but so much more we could’ve explored. The Lost Gardens of Heligan are definitely worth at least a half day visit or maybe packing a barbecue for a full day out. With storm clouds threatening we headed towards Bugle, stopping off at a pub in St Austell for a meal. After a pretty full day out a Steak and Ale pie was perfect way to end the day.